Archer’s Goon, Diana Wynne Jones, HarperCollins, 2000 (c1984), ISBN 9780006755272, 320pp. 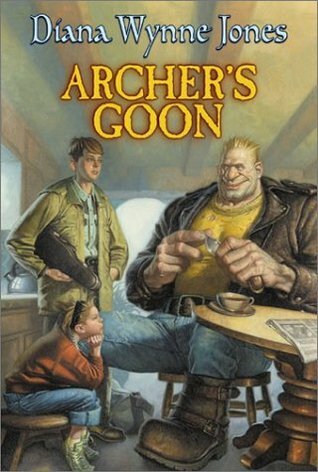 I had been wanting to read Archer’s Goon for quite some time, following my discovery of Diana Wynne Jones’ Chrestomanci series and generally feeling that she was my type of writer, something that hadn’t been dispelled by the enjoyment of a couple of her other novels like Eight Days of Luke and Howl’s Moving Castle (which, I believe, is soon to be a motion picture). But Archer’s Goon had been originally published in 1984 and no one had seen fit to bring it back into print. I searched in vain at used book stores while at the same time refusing to pay for overpriced copies over the Internet. Then J.K. Rowling happened (the analogy to a force of nature is intended), and young adult novels with magic in them have returned to the bestseller lists and the bookshelves. HarperCollins likely combed through their backlist to find this, and I’m glad they did, for it finally gave me an affordable chance to read this novel. The anticipation was well worth it, too. The book starts immediately with the introduction of the Goon of the title (an oversized ogre of a man) crowding the Sykes household, which consists of the protagonist Howard, aged 13; his little sister Awful; their live-in sitter Fifi; their father Quentin, a writer; and their mother Catriona, a music teacher. Archer sent the Goon there to collect 2,000 words from Quentin, something that Archer…and Archer’s brothers and sisters…believe is keeping them from ruling the world. Wait? What was that again? Yes, Archer is a wizard, and so is the rest of his family. But none of them trust the others, although they’ve divided the town up into different areas that each of them “farm”: for example, Shine controls crime, Torquil music, Dillian law and order, Erskine the sewers, and Archer controls electricity and gas. But one of them is keeping the others from branching out and controlling the world, and it has something to do with those 2,000 words that Howard’s father Quentin provides every month. Unfortunately, Quentin refuses to write those words for any of those people–not wanting to help them take over the world–and the wizards begin causing all sorts of problems for the Sykes family very quickly. The pleasure of Jones’ books is how the magic is integrated as a natural part of her worlds. While the characters who aren’t magicians still see the magic as surprising, they quickly come to accept and even understand it. In the context of a children’s book, such ready acceptance of the irrational mirrors the arbitrary world around young people, which oftentimes seems, if not actually is, illogical: Why can’t I stay out late? Why don’t we ever see dad’s brothers for holidays? Why don’t we always let the answering machine answer the phone, even when we are here? Archer’s Goon has plenty of twists in it, as Howard and Awful learn more about the world around them, including how their parents react to each other and the two of them, not to mention the secret of the Goon. I recommend this one highly.